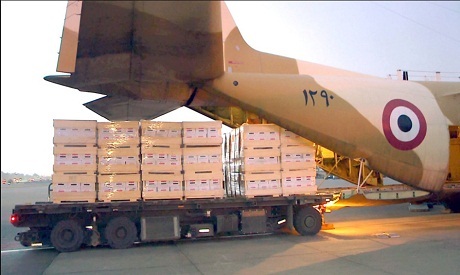 The Egyptian armed forces sent a C-130 military transport plane with food and medical supplies to Somalia on Thursday upon the directive of President Abdel-Fattah El-Sisi, state news agency MENA reported. Over half of the African country's population is facing a crisis due to an immense wave of drought. Life-threatening child malnutrition rates are rising to alarming levels in Somalia, the international aid group Save the Children said Thursday. The drought has left 6.2 million people -- more than half of the population of Somalia -- in need of immediate lifesaving assistance. A further 8.3 million in Kenya and Ethiopia are also in need of urgent help,said Hassan Saadi Noor, Save the Children's Somalia country director. Noor said he fears seeing "children dying in significant numbers."